If you like noodle soup and you like spicy food, you should definitely try this (and if you have never tried, why the hell haven't you?). 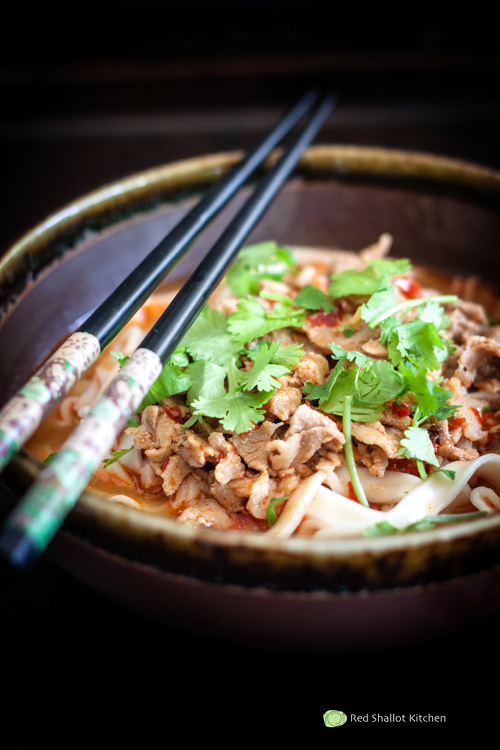 Dandan noodles/Dandanmien/Tantanmen hails from Sichuan province in China, known for their cuisine's bold flavors and spiciness. With its sweet pungent aroma, mouth-numbing and piquant flavors, all in delicious savory broth, the soups is literally an assault on your senses. But a good assault. Because you will be addicted to this. Because you will wake up the next morning and feel sad because you don't have any leftover. 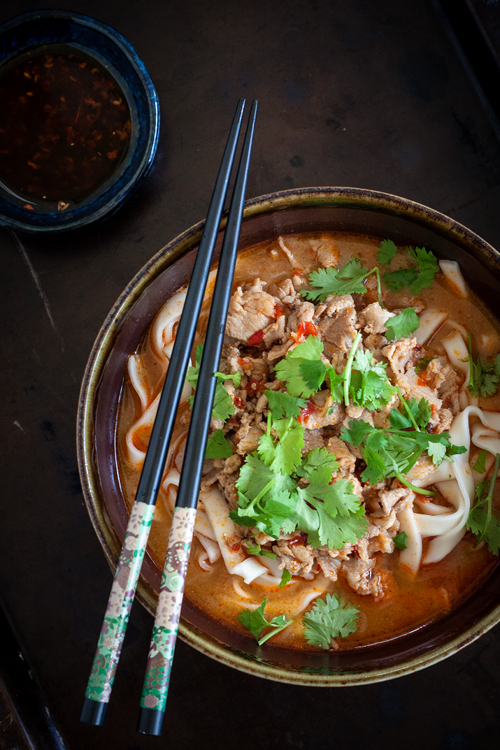 Because you realize that your regular noodle soup just won't do anymore. Combine all of the ingredients in a sauce pot. Cook over medium heat and fry the ingredients until garlics and green onions are browned, stirring occasionally. Reduce the heat and continue cooking until the oil turns darker color. Remove from the stove and set aside. Transfer oil to an airtight jar. Store in the cool part of the kitchen until ready to use. * The leftover chili oil stores very well and can be used for other dishes such as this one. In a large bowl, mix pork, soy sauce, garlic, ginger, and rice wine until well combined. Set aside to marinate for 15 minutes. Heat oil in a pot. Add pork and cook until brown. Stir in Douban and sesame paste, cook for about 1 minute. Add chicken stock into the pot, bring to simmer. Taste the soup, season with salt and white pepper if necessary. In a separate pot, boil water and cook dry noodles per package instruction. Drain the noodles and divide into 4 individual bowls. Ladle the broth over the noodles, sprinkle with a lot of cilantro. Drizzle generous amount of chili oil before serving. Today bloggers publish just about gossips and internet and this is actually annoying. get the link to generate free starcoins and diamonds for your game of moviestarplanet online. Nice details Check Rajasthan Board 12th Result 2017 from here after announcement. This is one of my favorite dish. It looks so yummy and tasty here. Everyone must note down its recipe and try it. Many of the games related with food making is available here. I must try it and play it with my fellow. There are a lot of designs of Rakhi is available on this. One can make their Rakhshabandan special through this. Awesome,you can Watch Fussball em 2016 live stream. Hello,you can share father's day sayings, greetings and messages. Wow,You can watch Tour De France 2016 live stream free. Such a nice information. Keep it up!!!!!! Tata Consultancy Services has launched an Enterprise Resource Planning portal dubbed as the TCS Ultimatix for better services of employees. The result of Bihar Board 12th Exam 2017 is going to be declared in the month of May. for seeing the result directly, you can go for our trusted website to see the 12th board result 2017 . Good information in regarding to TN 12th Result 2017 delivered here. Check & Download TN SSLC Result 2017 as uploads out. The Gujarat board will publish the 10th results 2017 soon.